Hello, I want to align my dish to Arabsat but my Satlink Ws-6906 doesn't have the coordinates. When I look for the coordinates they're to many numbers or something. 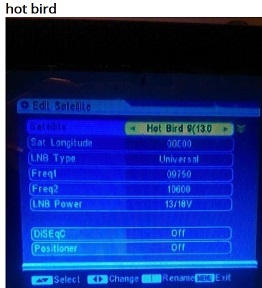 I don't know how to use the satfinder. Can anybody tell me how to use it? This screen shows a C band LNB selected with a local oscillator frequency of 5150 MHz. You are probably looking for the three Arabsat satellites, called Badr 4, 5 and 6, grouped at 26 deg East orbit position. If you are looking for Ku band (linear polarisation V and H) note the polarisation adjustment angle also. If you are looking for C band note the polarisation type (RHCP or LHCP).� Assemble your feed appropriately or read the manual if remotely switchable. In the Satlink you can set the LNB type and its local oscillator frequency (in the display is shows Standard and an LO frequency of 5150 MHz which is a normal C band LNB. You can input the LNB power supply voltage (13 or 18 volts), which will switch a Ku band LNB to Vertical or Horizontal. With a 'universal Ku band LNB' you can turn the 22kHz tone to the LNB OFF or ON to select lower or upper Ku band, e.g. 10.7 - 11.7 GHz using the lower 9.75 GHz LO frequency or the higher band 11.7 - 12.75 GHz using the higher 10.6 GHz LO frequency. Read: How does an LNB work. 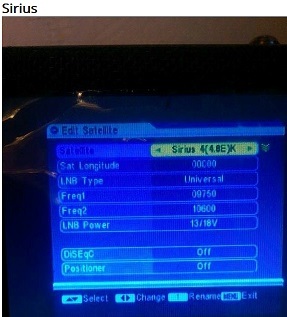 The satlink will certainly give you some indication when it aims at any satellite. If you can input your choice of wanted carrier frequency and you are certain that the carrier is actually operating then it may 'lock' to that carrier and give you more confidence that you are on correct satellite. Cheers. But I don't quite understand what I'm supposed to write in the Satlink. The attachment picture is where I'm located. Set the beam elevation angle to 23.1 deg using the scale on the bracket behind the dish. Set the rotation of LNB in its throat clamp to vertical and then rotate it 8.6 deg anticlockwise, while you are facing towards the satellite in the sky. 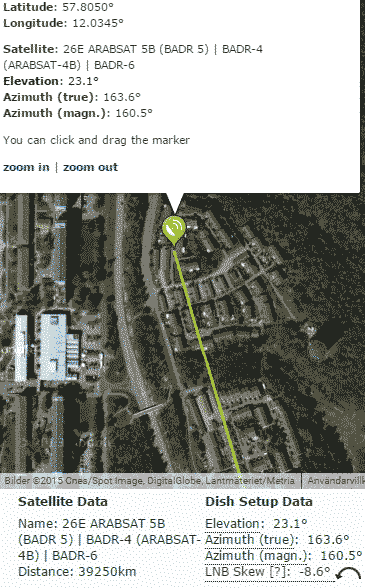 Point the dish in azimuth according to the green line in your picture and swing the dish boldly sideways either way. You will get a general noise power (signal intensity)� indication on the Satlink meter from any and all satellites. Peak up. If you go to lyngsat (as above) you can program the satmeter to tune to a particular carrier.� If you do this and the meter locks onto the carrier and gives a detailed response (signal quality) you know you are on the correct satellite. The meter may even display the TV picture - read the manual. 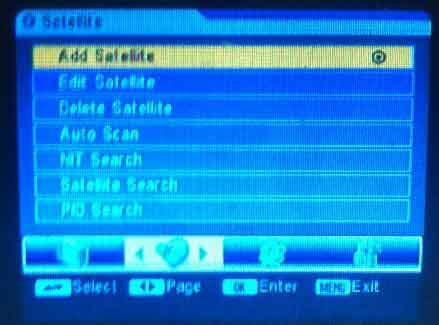 If you have satellite TV receiver it is the same process as programming the satmeter. 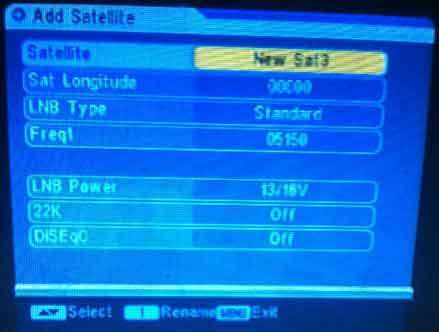 Tune the TV receiver to some satellite carrier in the lyngsat list.� Your receiver probably has very many carriers preset and will also be able to slowly scan the entire frequency band.� You need to tell the receiver what type LNB you have (C band or Ku band and possibly input the local oscillator frequency if Ku band). Once you are receiving a TV program from the lyngsat list you know for certain you are on the correct satellite. Some details may be out of date and in error. If you are on the wrong satellite just go up or down one degree in elevation and find the next one. The satellites are in a gently sloping line, descending slowly to the east and very slightly higher up towards due south, where is the top of the geostationary arc. Hello again. I tried to align the dish today but my satmeter doesn't have Badr preinstalled (or any other satellite for that matter). 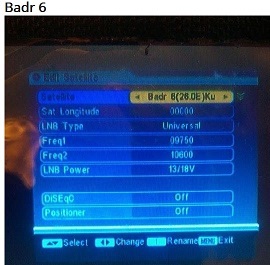 Every time the dish finds a satellite the satmeter gets ''locked'', but it never seem to find (Arabsat) Badr. You see here? Every satellite has the same ''info''. 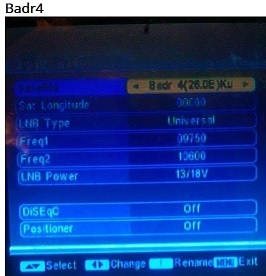 Do you know what I have to write in my meter to find Badr? The good news is that you are finding satellites. Well done. Set your elevation angle accurately and peak up on what you find. The elevation scale will only be accurate if the pole is truly vertical and the clamp to the pole tight. You are likely to be pointed at the wanted satellite or a nearby adjacent satellite. The SATLINK meter screens show that it already has a number of satellites listed in its internal list and that for each of these it assumes you are using a "Universal" Ku band LNB with two local oscillator frequencies 9750 and 10600 MHz. The SATLINK meter probably has a carrier list associated with each satellite. 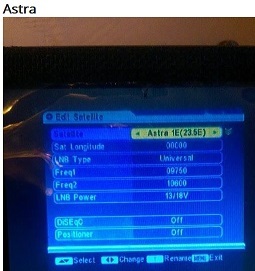 The manual says "The channel list will show all programs under the current satellite." It is likely that some suitable channels are listed. Select one, bearing in mind the type of LNB you have. Choose some significant, large, Free to Air (F) carrier to search for. Do not choose a carrier with 8PSK modulation. The carrier you choose must be Ku band or C band according to your LNB type. C band is 3700-4200 MHz, Ku band is 10700-12750 MHz. Note the polarisation of the wanted carrier. If Ku band you will need to rotate your LNB to set the polarisation angle and the voltage to select polarisation (V or H) and 22kHz tone to select lower or upper Ku band. If C band, your LNB may be remotely switchable in circular polarisations LHCP or RHCP or this may need to be done manually. It would help to know what type of LNB are you using ? Is it Ku band ? What type ? Is it C band ? What type ? This is the LNB im using. Dont know whether its KU band or C band. 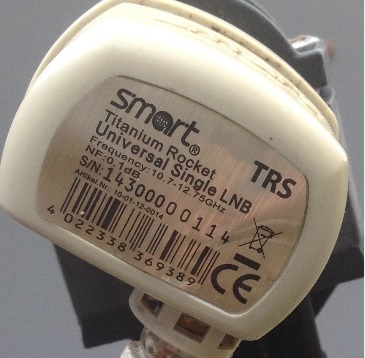 It is a "Universal" Ku band LNB. "Universal" Ku band LNBs have two alternative local oscillator frequencies, 9750 MHz and 10600 MHz with the higher frequency option selected using a 22 kHz tone injected into the cable. Such an LNB may be used to receive 10.7 - 11.7 GHz using the lower 9750 MHz LO frequency or the higher band 11.7 - 12.75 GHz using the higher 10600 MHz LO frequency. Universal Ku band LNBs have dual linear polarisation and may be switched remotely using two alternative DC supply voltages. 13 volts makes it receive vertical polarisation and 19 volts make it receive horizontal polarisation. Your LNB appears to be rotated in its yoke approximately 45 deg anticlockwise, from the viewpoint of you standing behind the dish and facing forwards towards the satellite in the sky. Note that this applies to the viewpoint of you standing behind the dish and facing forwards towards the satellite in the sky. As it is, you will be receiving approximately the same amount of power from both polarisations.� You will have a massive amount of interference. The two simultaneous signals will interfere with each other and your receiver will not work. When you set the polarisation adjustment accurately the interference will rapidly reduce to nothing as you get within +/-1 deg of exactly -8.6 deg.